The need to adopt digital technologies is forcing companies to re-examine their approach to business innovation. Digital technologies are providing more opportunities for firms to capture new markets and oust incumbents. Small businesses are leveraging resources disproportionate to their size (e.g. through cloud computing) and benefiting from their agility, heightening their disruptive impact on markets. Large businesses, in contrast, often struggle to adapt to this new innovation cycle. To compete effectively, big businesses need to find a way to leverage scale to generate more and better innovation. 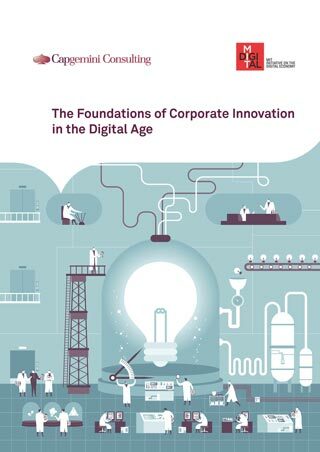 Produced by Capgemini Consulting and MIT Digital, the study looks at how large enterprises can advance corporate innovation in the digital age. It is a must-read report for those driving innovation in their organisation. Innovation Architecture ― How a company best balance the exploitation of existing core assets and the exploration of new businesses, and organise effectively around this balance. Innovation Sources ― How a firm best source innovation, either from within the firm or outside of it. Innovation Capabilities ― What capabilities are critical to support corporate innovation in the digital age.